A good garden should offer something for every day of the year. This does seems a tall order but it’s quite possible with careful planning and clever planting. We tend to think of winter as a dead time of the year but we shouldn’t - it is one of the most magical seasons. It is when the summer froth has gone, and the garden is carpeted in autumn leaves with the winter sun gradually reaching its lowest point in the sky. Then, slanting through the garden the rays picks up the finer details of for instance the grey lines on an old oak gate, or the contours of a pebbled path, or the beautiful textured bark of a tree - rather like a stage spotlight picking up a lead singer. This is when that well-placed tree, a tall elegant grass shimmering against a winter sunset, or the ragged bark rimmed by the low sunlight shine. The tree is king of the showmen in winter, but it’s important to choose a good one and to give it a central position. Don’t hide it away in a dark corner, for anything that shines in winter light must get winter sun to shine. Plant with care and stake immediately. Opt for slow-growing trees if possible: they make a better shape than fast-growing, lanky trees. Winter trees are generally chosen for their bark, like prunus serrula, also known as the Tibetan cherry.This is a fabulous tree with polished mahogany bark that peels off in sheets as it matures, revealing new glossy red bark underneath that glistens in the winter sunlight that you just want to stroke. Once your tree is mature, wash the bark with cool water and a car sponge (minus any detergent) to spruce it up. It will be well worth it. 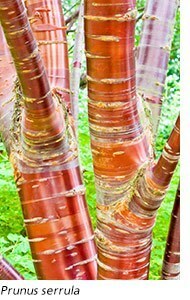 Birches provide the best bark and it can vary from cool-white to pearlescent pale-coral depending on type. The bumpy lenticels, which mark the bark horizontally, make patterns almost like morse code, adding fine texture. When the tree is mature it will shed bark, which could almost be written on, and there’s nothing as soothing as hugging one of these birches on a cold day and feeling the warmth from within. It may look lifeless, but like so much of the garden it’s hibernating. The overhead branches of birches form a dark canopy of fine growth that provides a kaleidoscope of light and shade patterns throughout the day as the sun moves round. You can underplant them with spring woodlanders, or grow them as specimens in the lawn. Betula utilis var. jacquemontii ‘Doorenbos’ develops silvery bark very early in its life - making it an excellent choice. A Dutch clone, named after Albert Doorenbos who spotted it in 1933, it was first known by the evocative name of ‘Snow Queen’. This upright tree, of slender proportions, has an icy presence with almost white bark. Another fine form, ‘Grayswood Ghost’ was discovered in a garden at Grayswood Hill, Haslemere in Surrey circa 1956. This has larger leaves and, like all birches, it develops yellow autumn tints before the leaves fall. Acer griseum will give you a glorious display in the autumn when the maple-like leaves turn brilliant shades of orange and scarlet, dropping to carpet the ground revealing the decorative bark. Originating from China, this small, slow growing tree was introduced into the UK by Ernest Wilson in the early 1900s and is one of the most spectacular trees when the cinnamon coloured bark peels off like paper in layers from the trunk and primary branches, living up to its name of ‘paper bark’ maple. For a sheltered spot away from cold winds, but where you can appreciate the striated white and green bark snaking down the trunk there is Acer Davidii, or commonly known as the ‘snake bark’ maple. Plant it near a pathway so you can admire the bark on a winter’s day and its autumn colour. You don’t have to strain your eyes to spot tall grasses. They lord it above the garden in winter, moving and swaying and catching low light. And yet gardeners are reticent, afraid that grasses will roam through their borders or set lots of seeds. In our cooler climate most grasses do not set seed and good grasses are clump formers, not running invaders. Perhaps the thuggish reputation of the striped grass, gardener’s garters (Phalaris arundinacea var. picta) has put them off forever. It’s taller grasses that make most impact now and Miscanthus sinensis ‘Malepartus’ is a graceful light grass that allows the sun to shine through its veil of gossamer heads. ‘Malepartus’ is an early bloomer (from mid-August onwards) with finely-tined reddish awns that develop into mink-brown within two weeks. It’s airier than most - and will reach 2m. ‘Kleine Fontane’ (literally little fountain) and ‘Kleine Silberspinne’ (little silver spider) are both shorter forms at 1.5m and 1.2m respectively. ‘Kleine Fontane’ opens pink and fades to silver and ‘Kleine Silberspinne’ opens silvery. These forms bear plenty of flower. 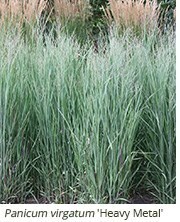 Miscanthus sinensis are hardy and easy on reasonable soil that is not too dry. They will keep their shape until late-January at least, but they're best cut down soon afterwards because they break into growth early in the year producing lush new foliage - usually by April. This bright young foliage can make an excellent backdrop for tulips. Cut miscanthus back too late and you’ll be cutting into the new growth. Deciduous panicums, or the switch grass as it is known are versatile plants, emerging in the spring with fresh lush foliage, perfect companions for spring plants, then developing their colour and airy flowers through summer leading into their spectacular autumn foliage. Panicum virgatum 'Heavy Metal' is one of my favorites as it has this gorgeous steely blue-grey foliage which fades to tones of yellow and beige as the winter deepens, keeping its upright habit - lovely for adding movement to the garden. Combined with Rudbeckia laciniata 'Herbstsonne' or Veronicastrum virginicum 'Fascination', the skeletons of these plants will give you structure and interest through the winter. If you want to create a rigid upright, the best grass is Calamagrostis x acutiflora ‘Karl Foerster’. This shoulder-high grass packs in lots of stems topped by tapering upright grassy heads. These appear in summer and, as autumn and winter arrive, the sheath of stems turns russet-red. 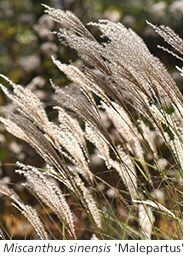 Pampas grasses, Cortaderia, are also very upright in form, and far too good for bungalow lawns. They add great winter presence and stand out well late in the year with the wine-red lollipops of Cotinus coggygria 'Royal Purple', the smoke bush. This deciduous shrub loses its leaves late on, developing flecks of bright-pink in cold conditions. Cortaderia selloana ‘Pumila’ is a relatively short and more compact plant, so ideal where space is limited. If you prefer fluffy caterpillars at the front of the border opt for Pennisetum alopecuroides ‘Hameln', a much hardier form with browner fuzzy bear caterpillars topping a roundel of foliage. These will persist throughout winter in a southern sheltered gardens. Silver, mink-brown and black are very much a monochrome scheme and the colour that lights everything up is red, however small the quantity. 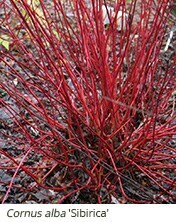 European dogwoods (not to be confused with the harder to grow Chinese and American species) develop damson foliage and colourful stems that include the red-stemmed Cornus alba ‘Sibirica’. C. alba 'Elegantissima' has deep red stems but this variety has pretty grey-green variegated leaves with a white margins which can make a lovely informal hedge. 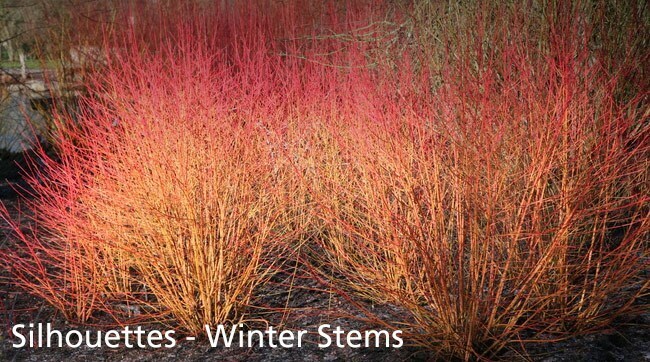 These thicket-making shrubs send up pencil-thick stems every now and again and winter light makes them look extra vibrant. Once established the technique is to cut them back hard every year in March or April, so that they produce new, shiny stems each year. The dogwoods have to be well established though, so allow them three years to settle in. There are also gold to green forms of dogwood, such as Cornus sericea ‘Flaviramea’ which has luminous bright yellow-green stems. This variety does well in any soil and are one of the few plants able to tolerate wet ground, so very useful near ponds. Still water also mirrors these stems to great effect. If you need something smaller, there are dogwoods that form small shrubs covered in small twiggy growth. These look like licking flames rising up in winter light, and they glow placed near green foliage, such as box (Buxus sempervirens). C. sanguinea ‘Midwinter Fire’ is one of these that will make a small shrub,benefiting from having some of the older twigs removed every spring. While discussing stems we need to mention Rubus cockburnianus. A bit of a thug with its arching thorny stems, and not a showstopper in the summer but come the winter when the leaves have fallen the exposed stems develop a ghostly white bloom that look luminous in the winter light. Planted in a woodland garden on its own or with the cornus it will shine, or perfect for a impenetrable hedge. Intricate seed heads providing a profile and refuge. Seed heads can be beguiling. However care must be taken not to allow seed heads that deliver hundreds of seed free reign. 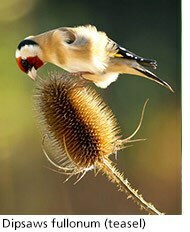 Remove most teasels, poppies, aquilegias, foxgloves (the latter while wearing gloves) as routine, unless it’s a wilder place. You can enjoy acanthus seedheads in winter, because these rarely produce viable seeds in Britain. Their handsome brown oval seedpods are covered with a bract and the whole spire is wonderfully architectural. A. spinosus is the most architectural, a tall plant that should produce six or seven flowering spikes. Phlomis heads are also useful in winter and their cavities, just like the bracts of acanthus, provide shelter for hibernating insects. P. russeliana (known as Turkish sage) bears whorls of yellow flowers on square woody stems and these fade with great grace, although this plant needs space to spread. Verbenas also fade well including the willowy purple V. bonariensis and the pink candelabra of V. hastata. Some self-seeding will occur, but it will not threaten. Rudbeckias and echinaceas are perfect for leaving in the winter garden. As the stems and foliage die back in the autumn, the cone seed heads are left standing aloft which are beautiful in their own right basking in the winter sun. Not only will you enjoy them but the birds will adore teasing out those seeds when the picking are a bit thin in the garden. Finally some plants, such as hydrangeas and sedums have strong enough flat heads to persist through winter. The golden rule is, if it flops, cut it back.